Oahu is about to get a new swap meet, to be located in Waikiki, that hopes to generate business from the island's repeat visitors. 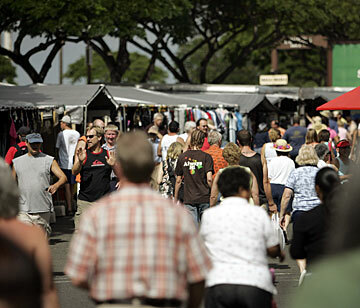 Above, shoppers were pictured last week at the Aloha Stadium swap meet. The city's Waikiki Shell, devoid of regular events since the former Kodak Hula Show pulled out in 2002, could soon be bustling with tourists again when the South Pacific Cultural Center at Waikiki opens next week. A self-proclaimed cultural village, the center will showcase made-in-the-islands fine art and crafts and offer cultural learning in a stylized swap-meet atmosphere. It's the brainchild of Jane Iida, who helped found Maikai Enterprises*, a tourism-transportation company, several years back. "Waikiki has been dead for many years, and many travelers complain that there is nothing new to do, especially at night," said Iida, who serves as the chairwoman and chief executive officer of the South Pacific Cultural Center. By opening a cultural village and offering retail and learning opportunities to tourists during the day and a place to see a cultural show and have dinner at night, Iida hopes to give Waikiki's ever-growing number of repeat visitors something new to revitalize their interest in a mature destination. "People are traveling to other destinations -- we want to bring them back to Hawaii," said Iida, who has been granted a revocable permit from the city to operate her village at the Shell. The center, which will hold its grand opening next Wednesday, will host between 20 and 40 vendors each day on the 2.5-acre grounds, said Gilbert Garcia, marketing director and vendor coordinator for the center. "We're working with several master woodcarvers and artisans to create a village concept where people can train to produce cultural products," Garcia said. The local-style retail village will spotlight the cultures of Hawaii, Fiji, Tonga, Polynesia, Samoa and the Maori, he said. Gates will open from 10:30 a.m. to 3 p.m. for shopping and cultural demonstrations. A snack bar, coffee stand and bar will be open during both the day and evening. Centerplate, the manager of the Aloha Stadium Swap Meet, has been contracted to serve a Hawaiian-style buffet dinner nightly, with seating starting at 6 p.m. Chief Sielu Avea, a local fire dancer, will produce an island-style show that will run each night from 7 to 8:30 p.m. Eventually, Garcia hopes to help create employment and training opportunities in the village for recovering drug addicts and other disenfranchised populations. "These people need something to give them purpose," he said. The center is trying to develop a nonprofit agency to handle its rehabilitation offshoot. Iida's hope is that the center format will promote authentic Hawaii, she said. "Throughout my life in Hawaii, I've become close friends with many Hawaiians and locals with other South Pacific heritage backgrounds and have heard their ideas, comments and hopes of how they wish to preserve their cultures," Iida said. "Now that I am in a position to develop their ideas, I am trying to promote this with the assistance from all available resources, various communities and financial aid to materialize this dream for the benefit of everyone in Hawaii and generations to come," she said. Among those who support Iida's vision is her newly hired general manager, Kawika Cameron, who quit his job as a logistics manager for BAE Systems to help develop the center. A native Hawaiian from Hilo, Cameron said the center will bridge the gap between the state's tourism industry and its host culture. "What's hardest to find in Hawaii is Hawaii -- you can find everything else," Cameron said. A rebound in tourism numbers provides more opportunity to educate people about the Hawaiian culture, he said. "Our visitors need to see that Waikiki is more than just a city of concrete," Cameron said, adding that the show has the potential to reach as many as 2,000 kamaaina and visitors nightly. The village is the first permanent event to go into the Shell since the hula show ended in 2002, after the Hogan Family Foundation failed to find sponsorship to save the show, which had been a Waikiki tradition since 1937. Right after 9/11, visitor arrivals and spending were down and it was difficult for the visitor industry to find investors. Since 2003, the steady run up of tourism has led to reinvestment and expansion in the industry. Iida, the primary investor in the cultural center, said she is seeking other investors or sponsors to help meet the $2,000-plus permit fees and make infrastructure improvements to the Shell. "I'm taking every penny out of my pocket to make this work," Iida said. "I'm just a nameless small potato trying to make this dream come true." Iida is no stranger to the difficulties involved in making a tourism-based business work on Oahu. Following 9/11, Maikai Enterprises struggled so much that it was in danger of closing, she said. In 2004, the state Public Utilities Commission almost revoked Maikai Enterprises' certificate of public convenience when the company got behind in filing its required annual financial report and motor carrier gross revenue fee. After Maikai Enterprises made catch-up fee payments in 2003 and 2004, the commission vacated an order to consider suspending or revoking the company's certificate, ruling that "the company had fully complied, although belatedly, with the motor carrier laws." "Many businesses were filing bankruptcy; I was lucky," Iida said. "My subvendors all gave me extra time to make my payments and worked with me. It was a struggle, but I survived." Times were difficult in 2002, but business has turned around since in Waikiki, where substantial tourism investment has already resulted in improvements. The Outrigger Beach Walk on Lewers Street and the Royal Hawaiian Shopping Center are undergoing major renovation and expansion, and the International Marketplace is making spot improvements. The Waikiki Shell, which is within walking distance of Waikiki hotels, is next in line for an overhaul, Iida said. Maikai Enterprises has turned around and Iida is using it to bankroll the cultural center, which has long been her dream. "It's risky, I know," Iida said. "No one else wanted to take this risk so this space sat. I'm a small lady, but I've got the guts of a big ocean."